thank you, from our hearts, as we reflect on all that you have given to help those most in need of assistance through SSRKP. Through Amma’s hands, by Her Grace and with your support, hundreds of families with children, as well as the elderly and incarcerated, have received much needed medical care, nutrition, education and clothing. Because of your generosity of spirit, Srimad Sai Rajarajeshwari Karnataka Projects has, over these years since we started, been able to provide for the entire expense of operating three free medical clinics, assistance with the periodic feeding programs and provision of funds to educate the children of Karekura Village. 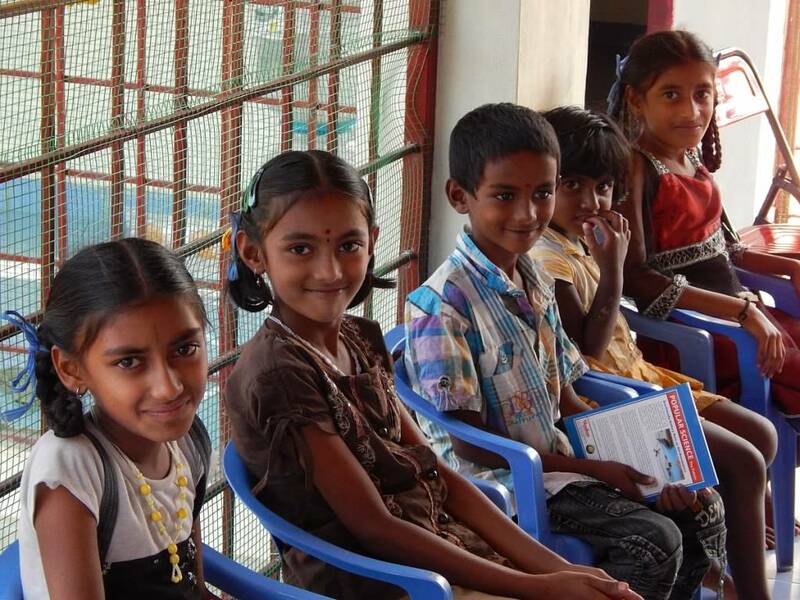 These programs operate through Amma’s Trust in India and are guided by Amma’s hand directly. We are grateful for your support and happy to be able to report to you the expansion of medical services at the clinics to include increased Medical Specialty Care. This extra care includes periodic cardiac and ob/gyn evaluations by physicians who volunteer their services. Previously, many of these women with various gynecological difficulties have never had a gynecology exam by a physician. Recently, Dr. Jeff, from New Jersey, was able to arrange for SSRK to receive free medications from Americare and needed medical equipment. He and his wife and partner in practice Theresa travelled to Mysore to deliver these. While there they offered support to the Medical Clinic Staff who work tirelessly all year, many on a voluntary basis. With the help of SSRK, Amma has also increased tuition funding and supplies for kindergarten through to university level education, the distribution of nutritional support through feeding projects and distribution of health tonics to villagers, additional diagnostic testing, and emergency care on select cases in cooperation with local hospitals. Future plans for expanding the Medical Project are in place. New services offered will include a dental hygiene program with preventative treatment and increased frequency of medical camps for specific areas of medical conditions including cardiac care and ob/gyn. The Education Project will expand as well and include yearly increases in tuition fees and school supplies for the children. Nutrition Projects for the periodic meal service offered on festival days at Amma’s abode will continue and expand. And Amma will continue Her yearly visits to the Mysore Jail, where She feeds both soul and stomach with nutritious meals, new clothing, and Her loving darshan and discourse. As we meet and expand our support for Amma’s Trust projects in India, we have concerns about meeting the ever-increasing needs for resources. We therefore share with you, our family of supporters, our heartfelt concerns, and we ask for your support in meeting the financial requirements of these life-supporting projects. Your donations mean everything to those who benefit from these urgently needed services. The number of patients being served has grown over the years and continues to grow. There is need for more staff at the medical clinics, including nursing and clerical support. The ability to continue and meet our goal to expand the support of education for the children is in question each year as we review, project and budget. The cost of supplying food and clothing is also increasing, as the price of goods increases each year as well, and there are maintenance costs for the clinic to be met as the increase in patients’ needs are met. We ask you, most sincerely, for your help, as we reflect gratefully on the joy, relief and hope given to so many already. We ask you to open your hearts and give the gift of good will and brotherly love to others. We offer a suggestion too, for what better gift to give, than a donation in the name of another? Would your loved ones, friends or business associates not be thrilled with a gift that brings joy to someone in need, in a country where each dollar goes much farther than we might expect? We believe everyone would love such a gift, for any occasion. Should you choose this gift of giving, we will be happy to send a special note of acknowledgement if you provide to us the necessary information. And, of course, your donations are tax deductible as per IRS (501)c 3 status. We ask that you keep us in mind throughout the year as you are blessed with bounty, have birthdays to celebrate and loved ones you want to memorialize. And remember, no donation is too small, and every dollar is appreciated. We welcome you to join with us and continue the support of those in great need, lovingly upheld by Amma’s hands and through Her Trust in Mysore. Please see details about donating under the contact us section of the website, Thank you so much in advance for your support.